The ancient city of Shakhrisabs (which means Green City) is indeed buried in verdure of orchards and vineyards. Architectural landmarks of Shakhrisabs are at least 500 years old with the famous Ak-Saray Palace and the Jahongir mausoleum built in the late 14th-early 15th centuries among them. Shakhrisabs is a traditional center of folk arts, especially embroidery, with many art pieces highly commended during international exhibitions in Canada, Turkey and Japan. Is also should be mentioned that it is a homeland of Tamerlane. UNESCO has decided to place the ancient city of Shakhrisabz on the list of world heritage memorials, a city which has left a significant mark on world civilization. The 2700th anniversary of the foundation of Shakhrisabz has been celebrated, demonstrating to the world the ancient values of this land, its greatness and beauty. Shakhrisabz, called "Kesh" in the Middle Ages - also known as ancient "Nautaca" - carried the nicknames "Dilkesh" ("Kesh" means heart-pleasing) and "Qubbat al-eleem va al-adab" (the dome of science and education) is one of the most ancient cities in Central Asia. In certain periods through its long history, it has appeared as the centre of some of the most important events in world history - sometimes glorious, sometimes tragic. During Bactrian times, the tsar-impostor, Bess (Artarkserks), was captured in one of the settlements of Nautaca and finally executed by Ptolemey, one of the commanders of Alexander the Great. This meant the end of the great Ahemenid Empire. Nautaca - Kesh was chosen by Alexander the Great to spend his winters from 328-327 B.C., from where he set off on a campaign to Oxiarte, where the family of this Bactrian aristocrat was captured. This prize included the beautiful Roxanne, who later became Alexander's wife. Alexander IV, the son resulting from this marriage, became the last tsar of the Macedonian dynasty. It was here, during long evenings, that Alexander was visited by the idea to marry his commanders to local Sogdian and Bactrian women, and thus execute his idea to join the East and West. Centuries passed, and Khashi ibn Khakim became more famous than Mukanna, (Covered with blanket), the leader of the strong anti-Arab movement who found his last refuge and excruciating death in 776-780 in the strong-hold of the Sinam mountains around Kesh. The death of Mukanna and the destruction of his movement was an event of great historical importance. Mukanna's death was the last effort made by the indigenous Movoraunnahr citizens to restore their lost freedom and ancient religion. It meant the end of the pre-lslamic era, the history and culture of this region, and a change to better conditions in all areas of material and spiritual culture under the rule of Islam. But Shakhrisabz would not be as famous if on 9 April 1346, in the village of Hodja-llgar, Taraguy, Temur was not born to the family of a noble landlord. Amir Temur - the future statesman and great commander. Wherever destiny took him, Shakhrisabz remained his native city, the place where he spent his childhood and youth, where his personality was formed, the dwelling-place where his father, Taraguy, mentor Shams ad-Din Qulal, and his older children Jahangir and Omar Sheikh were buried. 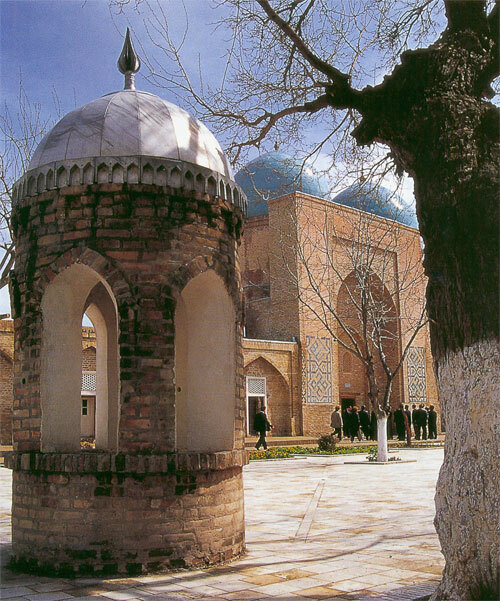 Shakhrisabz became the second capital of the great country he ruled. Bobur, the descendant of Amir Temur, wrote: "...As Kesh was the birthplace of Temurbek, he put much effort into turning the city into "the throne's pedestal" (government residence)". The most obvious evidence of this is the vast palace, Ak-Saray, which was incomparable with its contemporaries. Much was written about this palace, especially by Rue Gonzales de Klavikho, the Spanish Ambassador to Amir Temur, who was an important figure in the history of Shakhrisabz. Unfortunately, time had no mercy on this marvelous building and by the end of the 16th century this grandiose monument had been destroyed. Parts of the portal that remained are evidence of the scale of its construction; Ak-Saray is still unsurpassed in its intricate mosaic and other decorations that showed off the arts of traditional craftsmen. Above the portal of the Ak-Saray are huge letters saying: "If you challenge our power - look at our buildings!" Other remains of buildings of the Temurids' time can be found in the Southwestern part of the city. These are the remains of a once grandiose complex - the Dorus-Syadot (House of the prophet's decrees) mausoleum where Jahangir, the most beloved son of Amir Temur, was buried. This monument became the family burial-vault of the Temurids. Ancient plane trees still grow in this place - the sacred symbol of Shakhrisabz. Another fabulous complex is Dorut-Tilavete (The house of contemplation) consisting of two mausoleums - Khazreti sheikh (Shamseddin Kulial) and Ghumbezi Seyeedon with the Kok-Ghumbaz (Blue dome) mosque. There are two buildings of the same era that are more interesting for travelers. These are the covered market Chorsu, and the domed bathhouse. When we talk about Shakhrisabz we always imagine an evergreen city, with clear skies surrounded by the high Gyssar mountain range. Since time immemorial this city has been famous for its skilled craftspeople whose traditions are still being practiced in the wide-scale restoration and construction work that is being carried out even today. Today's Shakhrisabz, still maintaining it's traditional, historical appearance, has moved on to the next phase of its evolution. The famous Khudjum factory embroiders of tubiteykas (traditional hats), suzane, carpets, and belts - is known far beyond its borders. Modern Shakhrisabz is the historical and cultural center of the Kashkadarya oasis with a legendary past and a great future. 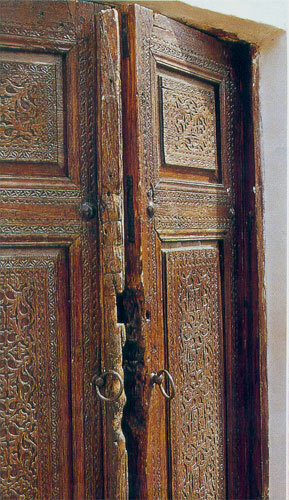 Ak-Saray palace - (14th -15th cc.). Dor-ut Siodat complex: Khazratiy Imam Mosque (14th c.), Jahongir mausoleum (14th c.). Dor-ut Tillavat complex: Gumbazi-Seiidan tomb (15th c.), Kok Gumbaz Mosque (15th c.). Shamshiddin Kulol Mausoleum (14th c.). 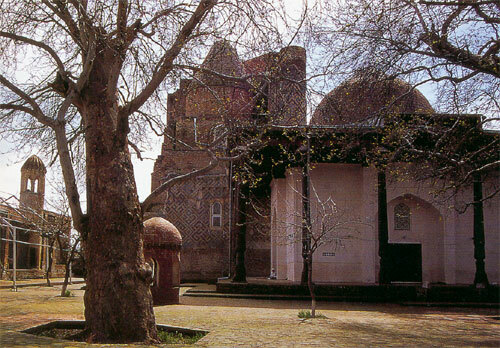 Malik Ajdar Mosque (15th c.). Chorsu covered market (14th c.). Medieval public bath (14th - 16th cc. ).